It is still classed as a high performance regulator in independent reviews. The XTX40 comes with all the features of our highly successful XTX50 with the exception of diver adjustable breathing resistance control. The XTX40 Octopus provides the same features and performance as the XTX40 second stage and includes left / right hand reversibility. 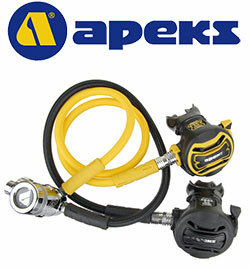 It comes with a high visibility yellow front cover and a 36" yellow hose. Suitable for cold water use (below 10 C / 50 F).